Preferred Pest Control Orange County has over 50 years of combined industry experience. We are a company where old fashion honesty, integrity & quality service is our core belief. We are licensed, bonded and insured. Our service areas include Irvine, Mission Viejo, Newport Beach, Rancho Santa Margarita, Anaheim, Fountain Valley, Fullerton, Brea, San Clemente and the rest of Orange County. Termites in the garage, ants in the kitchen, house in need of wood repair? We can remove, repair, replace and protect. 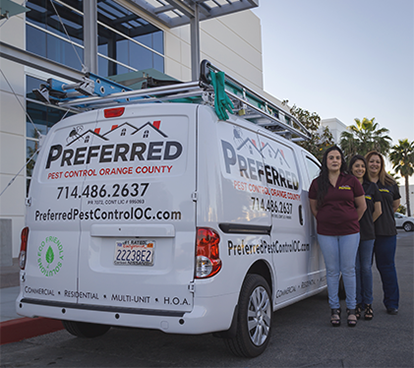 The staff at Preferred is ready to handle all of your Termite, Pest and General Contracting needs. We look forward to coming to your home or business and performing a thorough and knowledgeable inspection of your property from one of our highly trained & licensed Termite or Pest Management professionals. Our technicians and inspectors discuss all of your treatment options and explain to you the most efficient and effective methods of eradication & control. We look forward to exceeding your expectations.